At S & H Glenco Manufacturing, LLC, we offer screw machining services that can provide precision-made parts and products for the most demanding projects and applications. Our expertise, flexibility, and ability to provide consistent work on large volume orders have made us into a valued source for a wide range of industries. The product highlighted here was manufactured for an electronics industry customer and represents long-term production contract. In addition to the basic fabrication process, we were also tasked with nickel plating the 0.458" long, 0.790" diameter brass part. 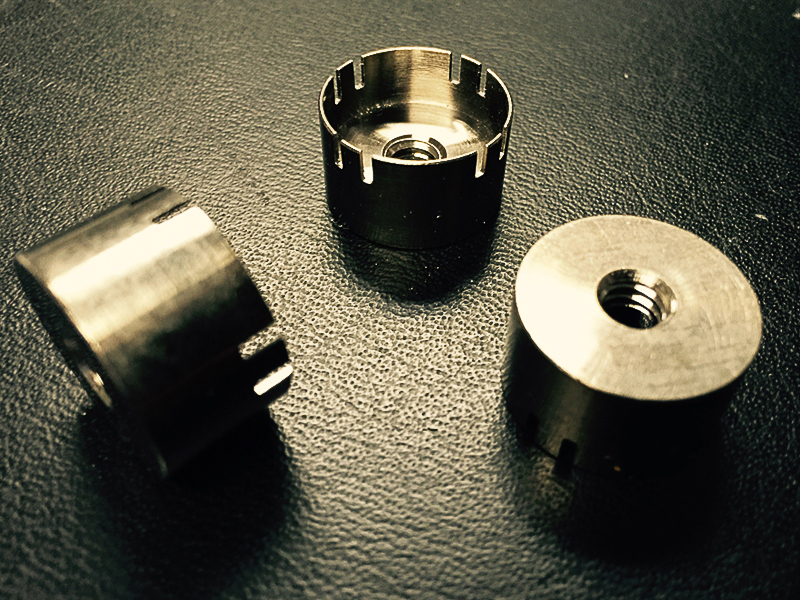 We used a variation of our screw machining process for the primary fabrication process. Threading and notch milling steps were added in order to follow the customer's part design. Deburring, plating, inspection, and testing steps followed. In this instance specifications required a tightest tolerance of ±0.001". We presently manufacture this piece for the customer, with 250,000 units produced annually on 6-week schedules. To learn more about our services see the table below, or contact us directly.